Hi Everyone! I hope you all are good.. We try to take as much care of our face and hands as possible on a daily basis but our feet are often neglected. 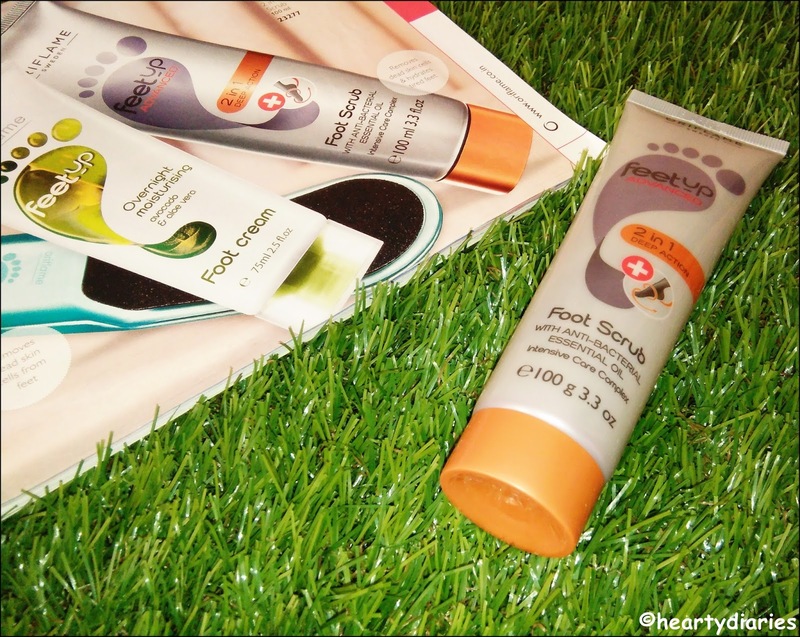 It is really hard to pamper our feet on a frequent basis because we feel it is time consuming. Also living in India and having well groomed feet cannot go hand in hand “always”. 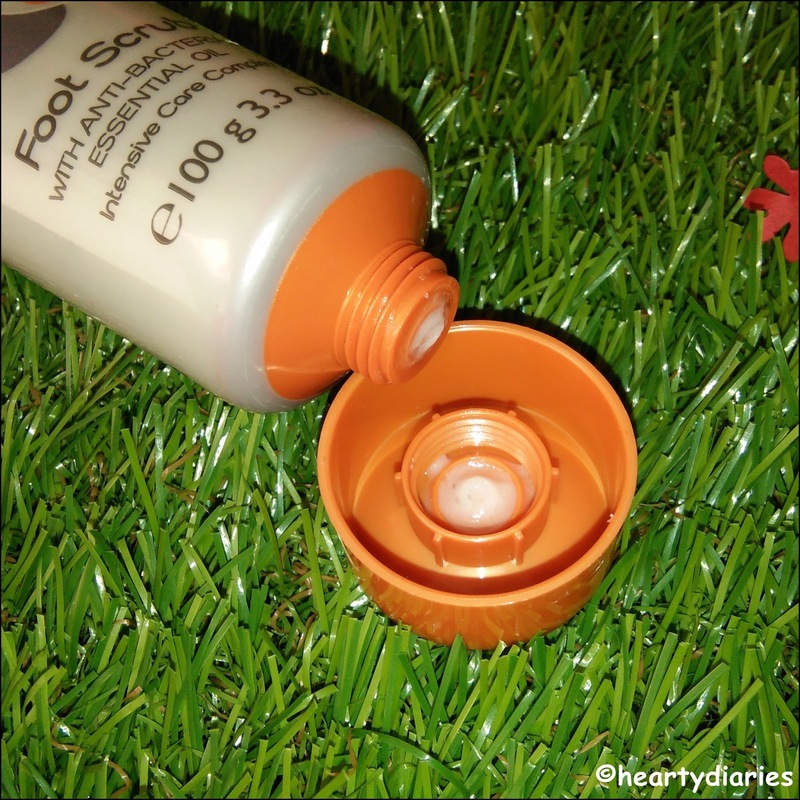 When I bought a lot of skincare and makeup products from Oriflame few months ago, I made sure that I added some footcare products too.. Today I am reviewing Oriflame Sweden Feet Up Advanced 2 in 1 Deep Action Foot Scrub for you all. This scrub has anti bacterial essential oil in it and has an intensive care complex which tantalised me to buy it.. The word “Deep Action” also lured me a lot.. Let me share important product details with you all first followed by my experience and last but not the least, the pros and cons I feel. Product Description: Advanced scrub with anti-bacterial Lemon Myrtle Essential Oil exfoliates rough skin while helping to protect against foot odour. Combining Intensive Care Complex with Shea Butter and Urea this rich exfoliant removes dead skin cells and hydrates tired feet. Directions of Use: Massage on wet skin and rinse off. Packaging: This scrub comes in a very soft grey rubber tube packaging; has an orange plastic screw cap. The tube is really soft to squeeze good amount of product out and the cap has a sturdy fitting which doesn’t allow the product to leak. Texture and Consistency: This scrub has a white creamy consistency which is neither too thick nor too thin with sparsely distributed green and brown scrubbing granules. The particles are mild on the skin and the scrub doesn’t lather up. Smell: The smell of this scrub is very minty and essential oils like. Visit Oriflame’s Official Site for more details..
Buy it for Rs. 260 here..
My Experience: This scrub seemed really promising due to which I grabbed it as soon as I read about it in the catalogue. 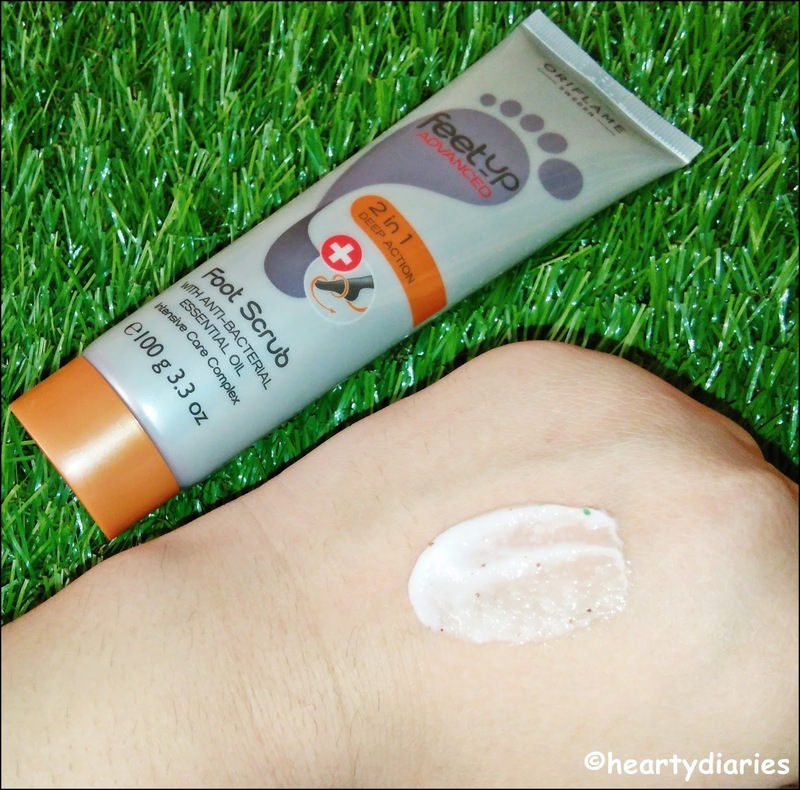 To test how much it could possibly work, I let my feet catch up some extra dust by walking barefoot 😀 When I went in to the shower, I washed my feet and squeezed out the scrub from the tube. The tube is extremely soft and the product comes out effortlessly. I took an ample amount of product on my fingers and applied it to my feet. 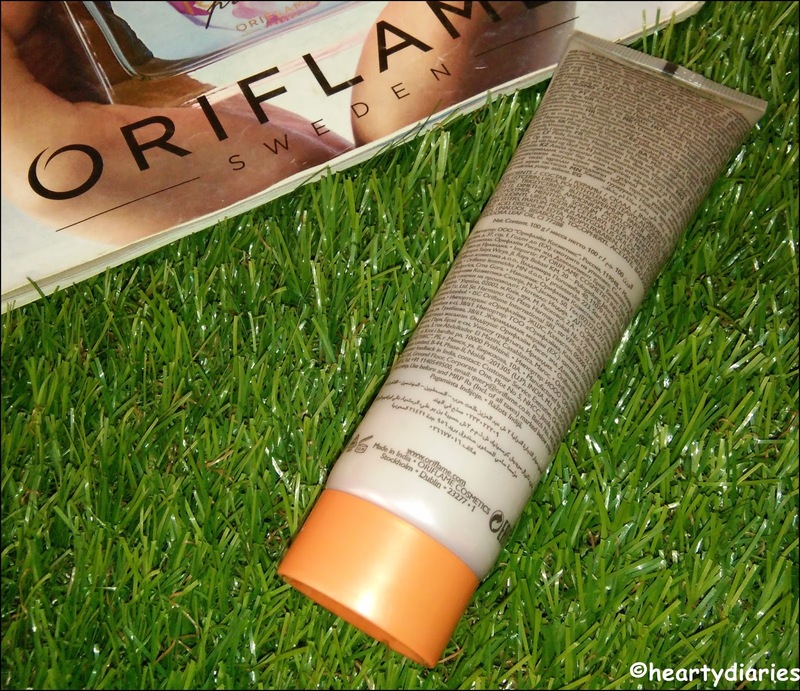 The first impressions were good because I really liked the “not-so-thick” and “not-so-thin” texture of this scrub having really gentle exfoliating granules. This scrub doesn’t lather up. There was a mild minty smell when I took the product out but it soon turned in to a very strong overwhelming smell which I don’t like at all..
After approximately three minutes, it was literally very hard for me to resist the smell. Once I was done scrubbing, I rinsed my feet and I was amazed at the instant soft and feathery touch my feet had. This scrub really exfoliates the feet well being gentle enough and hydrating our feet to a great extent. I could see that the dead cells were removed but I have used it many times now and feel that it doesn’t have any deep action. 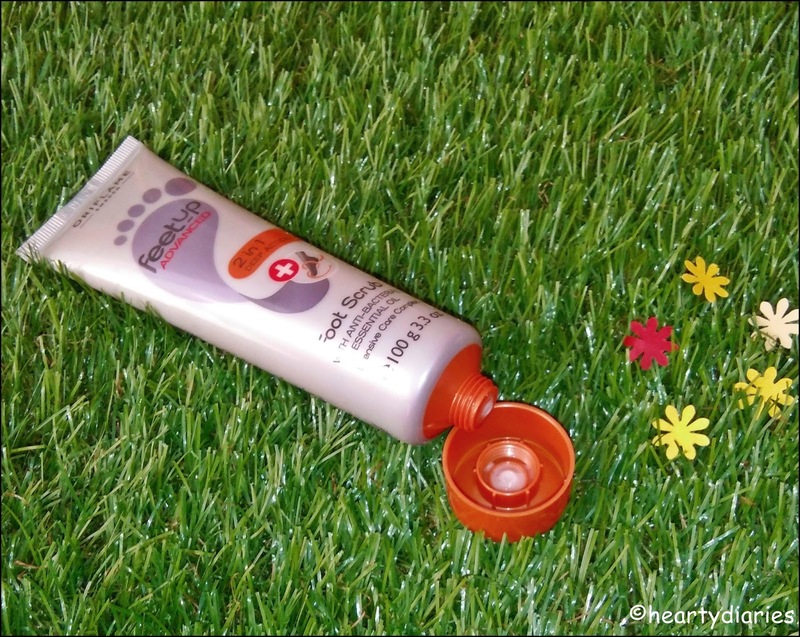 It didn’t cleanse my feet as expected and it has no visible effect on tanning or color improvement. They don’t claim to de-tan or brighten the skin but there should be deep cleansing atleast. Not completely.. According to me, it would have been 100% worth the price if it had a deep action really..
Not really. 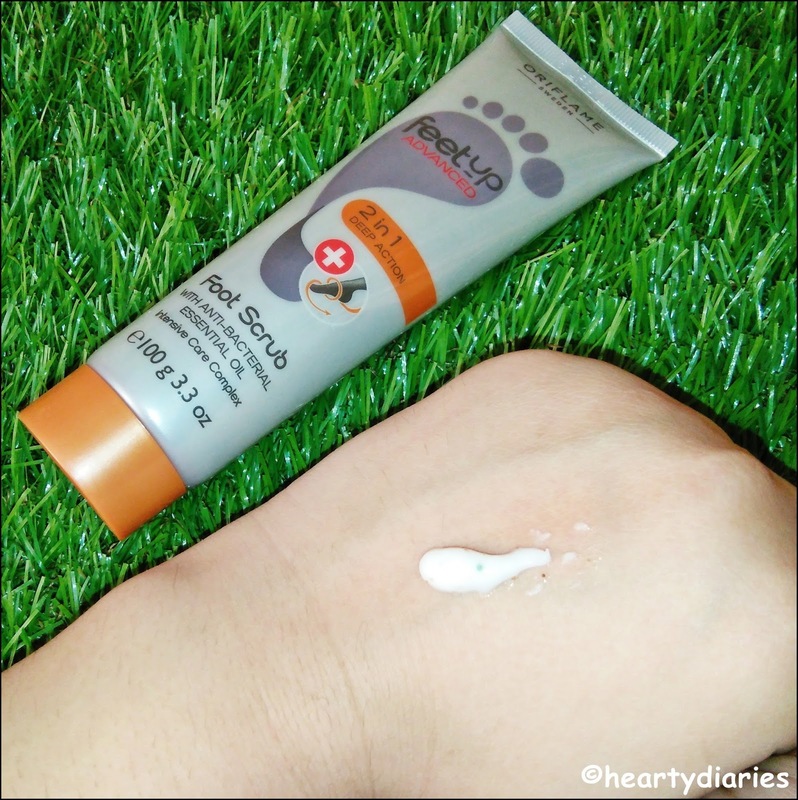 Even though I liked the hydration and satin smooth feel on my feet but I am not fully satisfied by the deep action it claims.. I’ll rather use Inveda D Tan Scrub on my feet which improves color, de tans skin and leaves skin refreshed and clean without having an overpowering smell.. Very good & detailed review. Thanks a lot dearie! ?? Maine husband aur beti k liye ye product liya hai aur ye bahut useful bhi hai ?? Yes it's gud but i expected a little more aunty ?? ?